Shortly after the arrest of 9/11 mastermind Khalid Shaikh Mohammed (KSM) (see February 29 or March 1, 2003), US investigators will allegedly find out that he had recently met with Osama bin Laden. Later in 2003, authors Nick Fielding and Yosri Fouda will claim that not long after KSM is transferred from Pakistani to US custody, he confesses that he had met with bin Laden within the past two months. Bin Laden is said to be in good health. KSM met him in the Pakistani province of Baluchistan after a journey involving a complicated network of phone calls and couriers. He also says that bin Laden has been concentrating his forces in South Waziristan, in Pakistan’s tribal region, and bin Laden has formed an alliance with Afghan warlord Gulbuddin Hekmatyar. Fielding and Fouda will note that this story seems confirmed by the fact that within days of KSM’s arrest, residents in the town of Chaman in Baluchistan said that US aircraft dropped millions of leaflets mentioning the $25 million reward for bin Laden’s arrest. KSM also allegedly claims to know that al-Qaeda second-in-command Ayman al-Zawahiri recently returned to Quetta, Pakistan, after spending time in the Middle East. Also within days of KSM’s arrest, millions of leaflets about al-Zawahiri and his reward are dropped in that region. [Fouda and Fielding, 2003, pp. 184] It is likely that KSM is tortured during this time (see Shortly After February 29 or March 1, 2003). KSM will later say, “During the harshest period of my interrogation, I gave a lot of false information in order to satisfy what I believed the interrogators wished to hear in order to make the ill-treatment stop” (see March 7 - Mid-April, 2003). Assistant Secretary of State Bobby Charles asks the CIA to analyze where the drug profits in Afghanistan are going. The CIA concludes that it is probable some of the drugs are going to the Islamic Movement of Uzbekistan (IMU), an al-Qaeda-related group just north of Afghanistan; the Taliban; the anti-US warlord Gulbuddin Hekmatyar; and possibly al-Qaeda. Charles says, “The linkages were there.” Author James Risen later comments, “The connections between drug trafficking and terrorism that the Pentagon didn’t want to acknowledge were real and growing, and were clearly helping to fuel a revival of guerrilla activity in Afghanistan.” [Risen, 2006, pp. 152-162] An article in the Independent this year will come to similar conclusions (see August 14, 2004). Based on this report and other evidence, Charles will push for a tough counter-narcotics policy but will end up losing his job instead (see November 2004). The New York Times reports that there is fresh evidence the Pakistani government supports many Islamist militant groups who are fighting US forces. Pakistani support for militants has mainly run through the ISI, Pakistan’s intelligence agency. The Taliban. 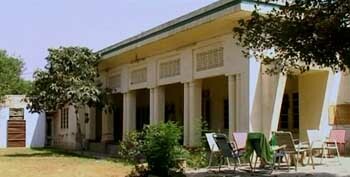 Taliban leaders are believed to be given safe haven in the Pakistani town of Quetta. The Haqqani network. This is a semi-autonomous branch of the Taliban, based in Pakistan’s tribal region. Its leader is Jalaluddin Haqqani, who has been an ISI asset since the 1980s. The Gulbuddin Hekmatyar network. Like the Haqqani network, Hekmatyar’s network is based in Pakistan but attacks US forces in Afghanistan in alliance with Taliban forces. Lashkar-e-Taiba. This Pakistani militant group is not very active in Afghanistan, but it has been linked to a number of attacks, including the 2008 attacks in Mumbai, India. The ISI’s S Wing gives these groups funding, training, protection, and intelligence. The groups are tipped off to planned US drone strikes and other attacks. S Wing operatives even search radical madrassas (boarding schools) in Pakistan to find new recruits for the groups. Most shockingly, ISI officials regularly sit in on meetings of Taliban leaders and other militant leaders and help decide strategy. This practice has become so widely known that in recent months, the British government has repeatedly asked the ISI to use its influence with the Taliban to scale back attacks in Afghanistan before the August presidential elections there. 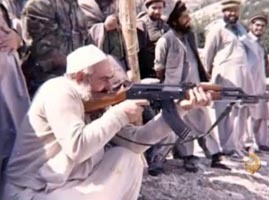 Deep Ties to Major Players in Region - Hekmatyar, among the most ruthless and extreme of the Afghan Islamic warlords, has had deep ties to Osama bin Laden, the CIA, the ISI, and the drug trade (see 1984), 1983, and (see March 13, 1994). On the eve of the Afghan elections, Hezb-i-Islami leader Gulbuddin Hekmatyar speaks out on the war in Afghanistan in statements to various media outlets. In a statement given to CNN, Hekmatyar says that he is willing to “help” the US and NATO forces if they announce a pullout timeline and prepare to leave Afghanistan. “We are ready to help with the United States and… other coalition forces if foreign troops announce the time frame for the pulling out their troops from Afghanistan,” he says in the statement. “I am sure Afghans will fight US forces and will continue Jihad against them like they fought against Russia before if they don’t leave the country,” he adds. Hekmatyar does not define what he means by “help,” nor is it clear if he would agree to join coalition forces against the Taliban and other insurgents. [CNN, 8/17/2009] In an interview with Sky News on the same day, Hekmatyar elaborates. He emphasizes that he is open to negotiation and a political process, but says his forces would stop fighting only if negotiations for an end to the occupation are made in good faith: “We are not against [a] political solution.… We are ready to negotiate with friends and enemies, with Afghans and non-Afghans. We will not close the door to negotiations.” However, he reaffirms his demand for an end to foreign occupation and also rules out participation in any Afghan government formed under US and NATO occupation. “We never want to take part in a puppet government under foreign dictators and to end occupation and establishing an Islamic government in a free Afghanistan via a free election,” he says. Hekmatyar also says he is open to negotiations with the Afghan Taliban, but points out that there are some Taliban who refuse to cooperate with the Hezb-i-Islami to form a united Islamic front. The United States, Britain, Saudi Arabia, and the Afghan government have been engaged in negotiations with Hekmatyar representatives over the last year (see February 2009 and Early April 2009) to discuss possible arrangements in which Hekmatyar, who is wanted by the US government for terrorism, is granted immunity and a role in a future Afghan government. In the Sky News interview, Hekmatyar denies negotiations with Britain, but acknowledges having had contact with the Afghan government, which he describes as a “dirty swamp” of corruption under foreign control of which he wants no part. He indicates that Kabul is powerless and unwilling to implement the advice (and conditions) he sent it for “ending the war.” [Sky News, 8/17/2009] Hekmatyar is considered to be among the most ruthless and extreme of the Afghan warlords and has had deep ties to Osama bin Laden, the CIA, the ISI, and the drug trade (see 1984, 1983, and March 13, 1994).